It’s that time of year! Barrister’s Ball tickets & t-shirts are officially on sale. 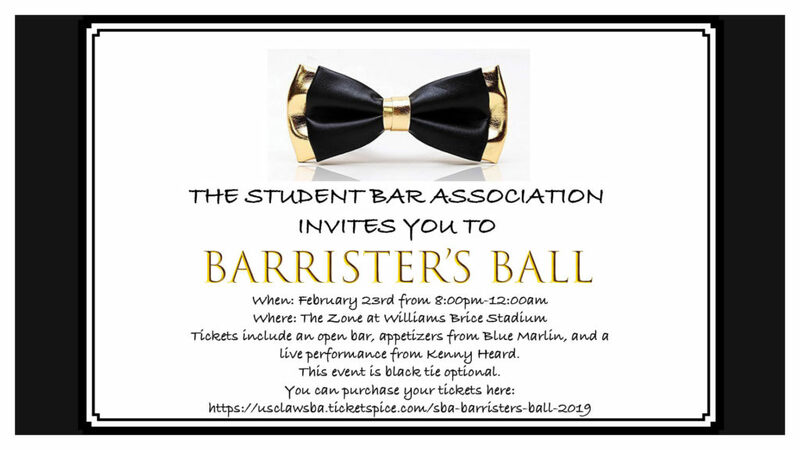 The University of South Carolina School of Law Student Bar Association presents 2019 Barrister’s Ball! The event will be held February 23, 2019 from 8pm to midnight, at The Zone at Williams-Brice Stadium. The first 500 attendees will receive a free koozie. The night will be filled with dancing to Kenny Heard & his band, delicious appetizers, and a full open bar. Attire is Black Tie Optional. Guys, if you would like a tuxedo, SBA has partnered with Men’s Warehouse for a $40 off discount on tuxedos. The group coupon code is 8378696. Pricing will GO UP to $60 the day of the event, so purchase early to save yourselves that money! If you have any questions, please feel free to contact one of your SBA representatives, or contact me directly via email, phone, or Facebook. Can’t wait to see you all there! This entry was posted in Uncategorized on February 6, 2019 by Nuri Aujla.